Elevated levels of blood pressure can lead to increased risk of heart disease and stroke. In fact, heart disease is the Number One Killer in the United States. Improving diet, reducing salt intake, stress reduction, exercise, and proper nutritional supplementation can help keep your blood pressure at normal levels. Research has shown that certain nutrients play a major role in maintaining proper blood pressure. Including them in your nutritional program can help you attain your blood pressure goals. 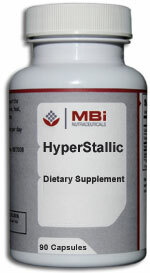 MBi Hyperstallic - Lower High Blood Pressure with natural ingredients of recognized efficacy.